I love a good pot roast recipe. I’m always looking for new ones to try! And for those of you who follow my food blog, you know one of my favorite ingredients to cook with is Dijon mustard. I just LOVE the taste of Dijon mustard in my recipes! 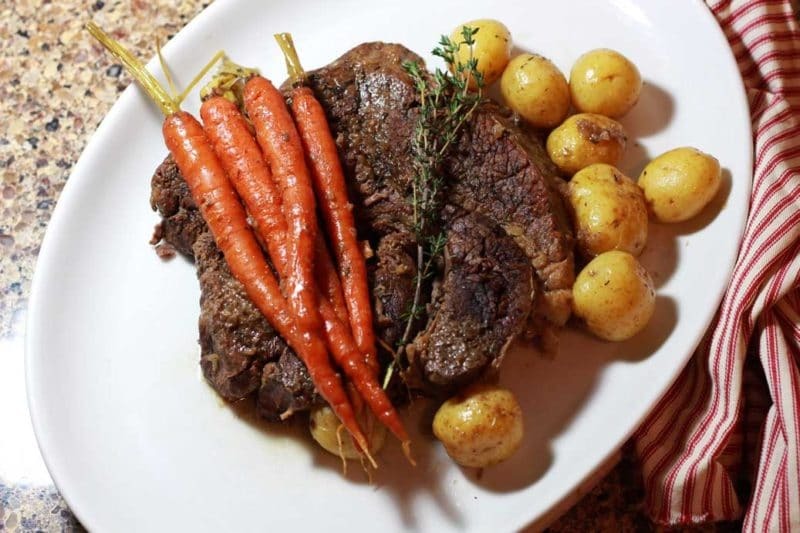 This pot roast recipe is savory and if you choose to use a flavored balsamic, it will make this dish even more flavorful! I used a cranberry balsamic vinegar and it turned out amazing! This recipe is also super fast to prep. Once it’s prepped, you will pop it in the oven to slow cook for several hours and that’s all! Easy! I love a low maintenance recipe! With any pot roast recipe, I always rub the meat down with my house seasoning. My house seasoning consists of salt, black pepper and garlic powder. I make a big container of it and store it in a tupperware so I always have it ready to go for future use. I’ll tell you how to make it below. You’ll love it! 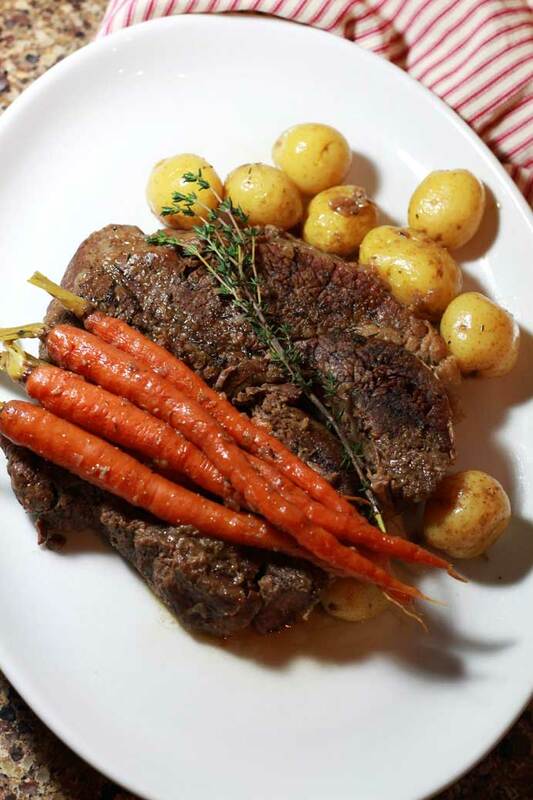 This pot roast is Gluten Free if you use a Gluten Free Beef Broth (such as Swanson). And let’s be honest…this pot roast is pretty and appetizing. I love using baby potatoes and whole carrots in this dish. 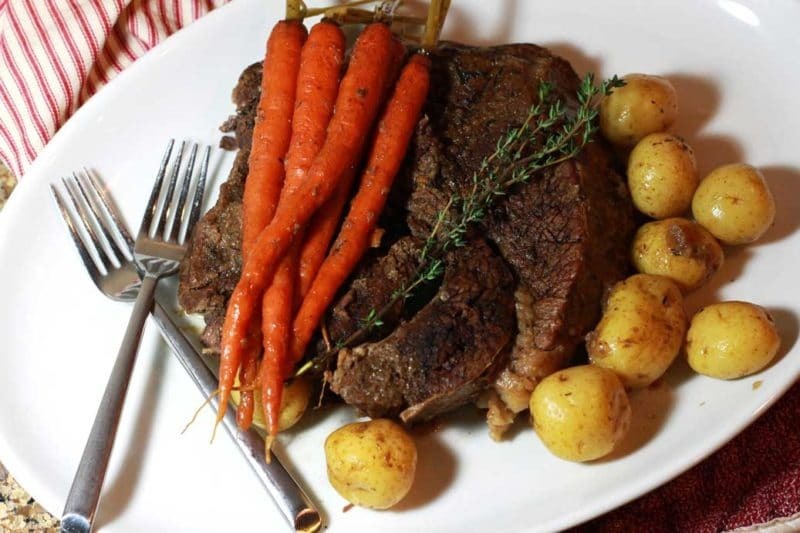 The balsamic and Dijon sauce you make for this pot roast soaks up nicely into your vegetables while it’s cooking, which pairs nicely when you bite into the meat! And yes, it’s still January and it’s still 70 degrees outside, but eating pot roast takes me back to my mom cooking in the kitchen when I was a little girl. 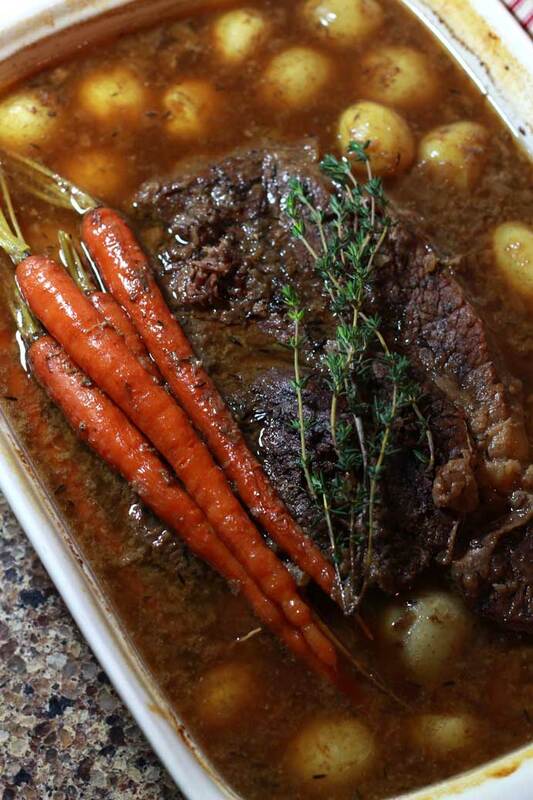 And I love that my kids run into the kitchen every time I make pot roast and say, “Ummm! What is that yummy smell?!? !” Plus, it’s winter somewhere in the world! And who doesn’t love to eat pot roast in the winter! In a large tupperware container or a glass mason jar, mix 1 cup of salt, 1/4 cup of black pepper and 1/4 cup of garlic powder. Place the top on and shake well to ensure it’s mixed really well. 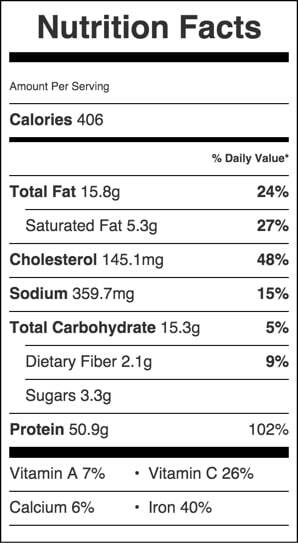 Set aside and store this for future use on other meat recipes. 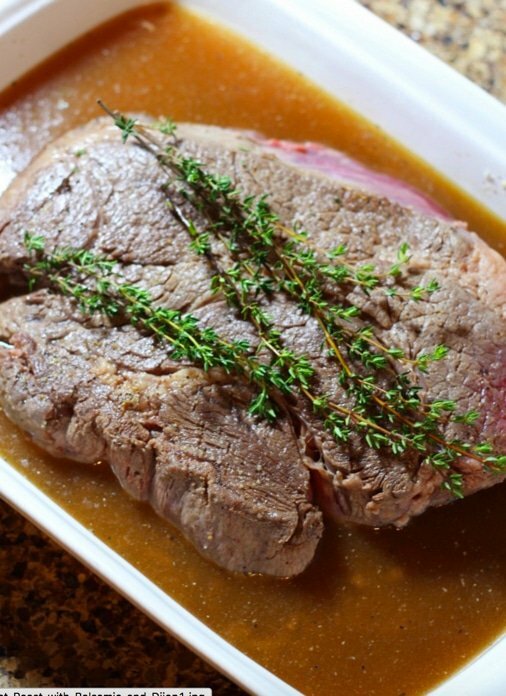 Take your pot roast and rub it down one side with 1 Tablespoon of House Seasoning. Turn the roast over and rub down the other side of the roast with the remaining 1 Tablespoon of House Seasoning. Heat oil in a large oven safe pan or dutch oven over high heat. Add the roast to the to pan or dutch oven and brown the roast, 4 minutes per side. Add chopped onion to remaining oils in your in pan/dutch oven and reduce heat to medium. Add balsamic vinegar to your pan with the onions and increase the heat to medium-high. Boil until the liquid is reduced and slightly syrupy. Stir in Dijon. Stir for about 1 more minute until ingredients are mixed well. Set roast on top of onions in your oven safe pan/dutch over. Pour in 2 cups beef broth and add thyme sprigs. 11. Add baby potatoes and carrots to the pan. 12. Cover and place in oven for 3-4 hours or until very tender. 13. You will know your roast is done when you can place a fork in the meat and turn slightly and the meat easily tears without pulling. 14. When serving, take a spoonful of the sauce and pour over the roast. Not that this roast needs any more moisture, but the sauce added on top makes it taste so good!